I’ve had a lot of fun shooting my new old cameras this year, but I also got out a couple old cameras I’ve had for a while and loaded some film into them, too. When I first wrote about my Kodak Tourist several years ago, I said I’d probably never run film through it because its lens was so unremarkable. But I had a roll of Plus-X sitting here doing nothing, and I thought maybe if I used my tripod and my GE PR-1 exposure meter I might get some okay results. Not so much. I had a dreadful time with this camera. I kept setting up shots only to have the exposure meter tell me there wasn’t enough light. Because the lens’s maximum aperture is a tiny f/12.5, this camera needs gobs of direct, blazing sunlight to make an image. 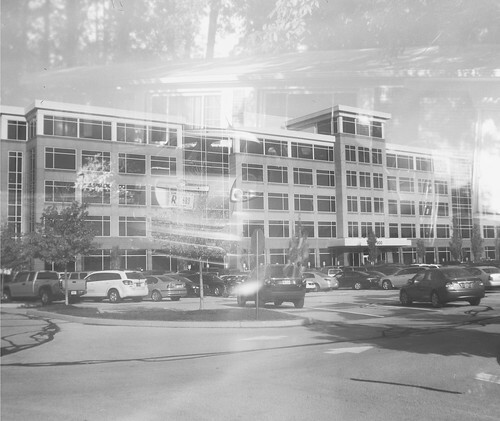 Ghosting ruined a few images, and then I managed not to advance the film on a few frames leading to double exposures. This double-exposed shot is the best one on the roll, sad to say. I uploaded three other shots from the roll to Flickr; see them here. I was so unimpressed with the Tourist that I demoted it. 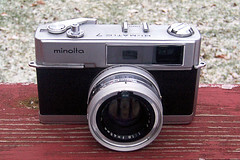 It had been displayed on a shelf in my living room, but now it’s in the box of unloved cameras that I keep under my bed. I had a much, much better time recently with my Minolta Hi-Matic 7. It was one of the first cameras I bought when I started collecting again, but I had only ever put one roll of film through it. It felt like high time to try it again. This time, I had a battery for it and would be able to see whether its autoexposure system worked. In went a roll of Fujicolor 200 and out went I.
I got great results with my Hi-Matic. It’s not surprising – its f/1.8 lens lets in more than 32 times as much light as my Tourist’s lens. And the autoexposure system worked fine. I just noodled around, shooting whatever felt good. As I drove to work one morning, the just-risen sun was casting long shadows. 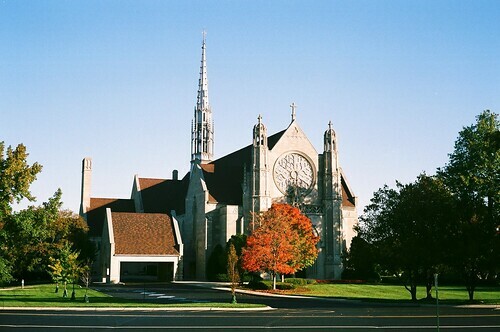 I stopped by Second Presbyterian Church for a snap. 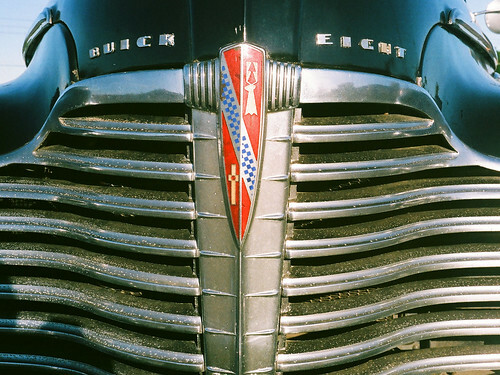 A few days later as I stopped at Costco to drop off a roll of film, I spotted a 1941 Buick in the parking lot. I moved in close to shoot its grille. I uploaded several other shots from this roll to Flickr; see them here. There you’ll also find the photos from the first roll I put through this camera four years ago. When I compare those shots to these, I’m delighted to see how much I’ve learned and how much my work has improved. I can think of few good reasons to own a Kodak Tourist. You can find far better vintage medium-format folding cameras for reasonable prices. But this one was all shiny and cost less than $10, so I bought it. I should be glad I don’t always have $10 in my pocket or my house would be crammed with shiny things. Before 35 mm photography took off in the 1950s, serious amateurs used medium-format folding cameras. They deliver big 6 cm by 9 cm negatives well-suited for enlargements. Also, when closed, they fit into a jacket pocket (though they tend to be heavy). Given these advantages, Kodak had been making medium-format folding cameras for at least 50 years in 1948 when it introduced the Tourist. In production until 1951, the Tourist kept with Kodak’s mission of photography for the masses by favoring low cost over high quality. Even though the Tourist is quite sturdy and its back is cleverly designed to be opened at either end, it is cheap where it counts – in the lens and shutter. My Tourist is the entry-level model, with a fixed-focus 86 mm f/12.5 Kodet lens (which I’m pretty sure is plastic) and fixed-speed Flash Kodon shutter, both of which seriously limit its versatility. Better Tourists came with glass Anastigmat or Anaston lenses, shutters with variable speeds, and scale focusing. But those Tourists can’t touch medium-format folders from manufacturers such as Agfa, Zeiss-Ikon, and Voigtländer, which could be had with wonderful four-element lenses, high-speed shutters, and even coupled rangefinders that took the guesswork out of focusing. Those cameras produced sublime images that best all but the highest-end 35 mm SLR and digital cameras available today. But those cameras were horribly expensive, while the Tourist was not. 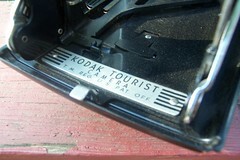 Judging by the number of Tourists available on eBay every day, Kodak probably sold thousands of them. Despite its low cost, my lowly Tourist probably took decent photographs in its day, as long as you were mindful of its limitations. I’m not going to find out whether my Tourist still takes decent photographs, though. 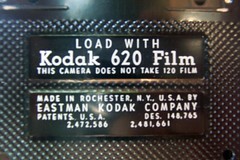 It uses 620 film, which Kodak stopped making at least 20 years ago. I’m not motivated to roll otherwise identical (and still available) 120 film onto its narrower spool, and I’m certainly not willing to pay somebody else to do it for me – not for a camera with such an unremarkable lens, at any rate. So my shiny Tourist will sit on a shelf. That’s okay with me. I like shiny things. Do you like old cameras? 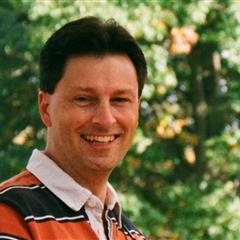 Then check out my collection!